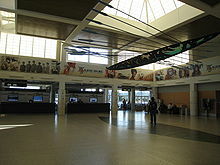 ^ C. Michael Hogan, Ballard George et al., Residential noise insulation at Seattle Tacoma International Airport, Earth Metrics Inc., published by the Federal Aviation Administration and Seattle Tacoma International Airport (1984). ^ United Airlines closing Sea-Tac pilot base (新闻稿). 西雅图时报. 2015年1月6日 [2016年1月11日]. ^ A航站楼. 西雅图港. [2016-01-14]. （原始内容存档于2015-12-30）. ^ B航站楼. 西雅图港. [2016-01-14]. （原始内容存档于2015-12-30）. ^ C航站楼. 西雅图港. [2016-01-14]. （原始内容存档于2015-12-30）. ^ D航站楼. 西雅图港. [2016-01-14]. （原始内容存档于2016-01-05）. ^ Sea-Tac Shuttle. Kenmore Air. （原始内容存档于2016年2月19日）. ^ 12.0 12.1 U.S.-International Passenger Data for Year To Date/Calendar Year 2018. ^ Public Transit. 西雅图港. [2016年1月14日]. （原始内容存档于2015年12月30日）. ^ Rental Car Facility Breaks the Ribbon Before Opening Under Budget. 西雅图港. May 6, 2012 [May 18, 2012]. （原始内容存档于2012-05-26）. ^ Consolidated Rental Car Facility. Port of Seattle. [November 8, 2012]. （原始内容存档于2017年1月7日）. ^ 18.0 18.1 Gillie, John. Rental Car Facility to Open at Sea-Tac. The News Tribune（英语：The News Tribune）. May 10, 2012 [May 18, 2012]. （原始内容存档于2013年10月4日）.